Whether they prefer to toss the dough themselves or order up delivery from a neighborhood joint, one thing is clear about Americans and pizza: they love it. Pizza has become a casual food staple in the United States and inspired wave after wave of restaurants dedicated to serving up slices. As of February 2017, there were more than 94,000 Pizzeria and Italian – Pizza and Pasta Restaurants in the United States. These two menu types combined make up 13.5% of the total US restaurant landscape in terms of total number of units. Pizzeria is the third most popular menu type in the United States behind Varied Menu and Mexican. The Italian – Pizza and Pasta menu type is also in the top ten. While the largest American pizza chains have made themselves household names through multi-million dollar advertising campaigns, Independent operators comprise a majority of the FSR market at 89% and LSR market at 47%. CHD Expert defines an independent restaurant as having less than 10 units in operation, while a chain will have 10 or more. The top four Pizzeria chain restaurants by industry sales share % for LSR are Pizza Hut, Domino’s, Little Caesars, and Papa John’s. Breaking down the market segments for the Italian – Pizza and Pasta menu type, Casual Dining makes up the majority of the landscape at just over 61%. Family-style (17%), Upscale Dining (13%), Quick Service (5%), and Fast Casual (2%) round out the top five market segments for this menu type. Whether they prefer a thinner New York style slice, deep dish from Chicago, or another regional variation, Americans have a long-lasting love affair with pizza that is unlikely to go away any time soon, especially because it lends itself so well to the growing preference for customization within the foodservice industry. Would you like more information on the pizza restaurant landscape in the United States? 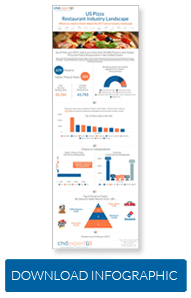 CHD Expert evaluated the most recent data within its foodservice database and packaged the most interesting facts and figures into a trends report designed to help foodservice industry professionals better understand the popularity of pizza restaurants in the United States. To access the 2017 Pizza Restaurant Landscape Infographic in its entirety, please click here.